It was probably a miracle. While rain washed both Scotland and the South, the immaculately-kept Royal Hale course was bathed in the sunlit clarity of late May. Yes, Fitz had arranged Golfing weather so perfect that it made even the national deficit seem to fade away, for just one precious afternoon. 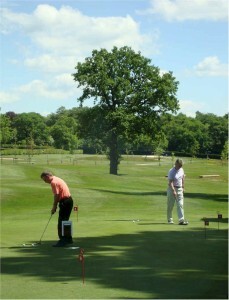 This year St Ambrose Golf Society fielded nine four ball teams to play two circuits of Hale’s 9 hole course. Some had travelled long distances, attracted by good food, great company, and the chance of glory and prizes. Dave Pugh was so excited he couldn’t sleep and arrived a full 3 hours before he was due to tee-off. Last year’s winner, Rick Devine was back with the hallowed St Ambrose Golf Society Trophy, hoping to retain it for the first time in its history. The successful 2009 Warrington Bus team (Riley, Harper, Wright and Wilkinson) was back in contention for the 4 man team prize. Eddie Coxon was back to defend his 2009 Nearest the Pin victory. And Dave Pugh was fully prepared with jacket and tie this year (a long story – see 2009). Dave joined Team 8 with Ryan Harper, Mark Atkinson (of Sale RFU and shortly Wasps) and Matt Molloy. And of course it was a Bank holiday weekend, contributing to a last minute rush. Phil “Shameless” Nodding (yes really) en route from Nottingham was seriously delayed by nightmare traffic on the M6, and would not arrive until an hour after Team 2’s start time. Disaster loomed, but Fitz organised a rapid re-jig. After several of Mac’s home made chopped fillet steak burgers the team sequence eventually emerged as a very non-sequential 1, 8, 6, 5, 7, 3, 4, 9, 2. Clearly, everything was going to be alright. 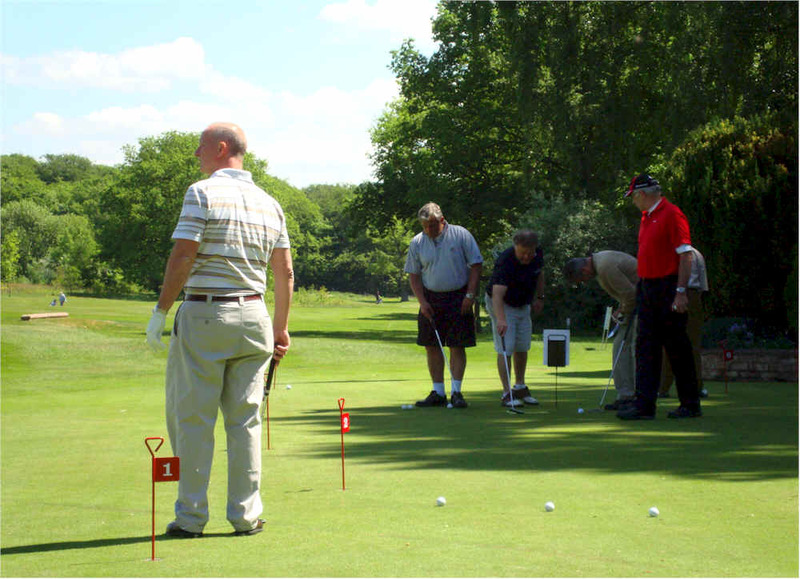 John Kennedy’s team 1 teed off and were away, putting down the markers for the straightest drive and nearest the pin, and the train of nine teams followed smoothly. Phil Nodding made it with time to spare and Team 2 were finally launched. It was a hot day, with hard ground underfoot. Maintaining hydration would be important after the 9th hole for optimal performance. The back nine would prove to be harder. However, some Hale members were clearly keen to follow on, so our teams made great efforts to keep on schedule. The last few teams selflessly omitted their drink after the first circuit, and pressed on in the bright sunshine. Quote of the day (from a Hale GC member) “Those are gardening shorts, and his shirt’s not tucked in!” Whoops. Fortunately it was John Accro, and he was joking. After the second circuit, essential rehydration at the “19th” with Banks’ Best bitter developed into an amiable gathering on the terrace and bar as the last few teams came in. As Ian “the Owner” carefully worked out the scores, the conversation ranged far and wide from shared reminiscences to careers, families and the 2010 World Cup. 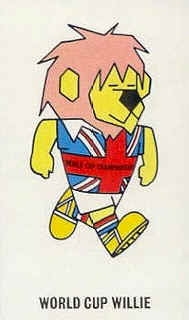 Who would have guessed the connection between St Ambrose and England’s 1966 first-ever World Cup mascot, World Cup Willie? 1966 “World Cup Willie” song – written and performed by our own Lonnie Donegan. As there is no official England song, World Cup Willie has been re-recorded by Lonnie Donegan Jnr. for the 2010 World Cup). All too soon we were called through for dinner and prize giving. John Kennedy said Grace, thanking St Ambrose for the weather, and after a superb 4 course meal from the esteemed Maccie, introduced our organiser, Peter Fitzpatrick to present the Golfing prizes (full results below). 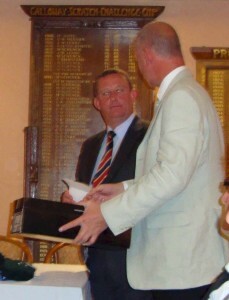 Brian Coghlan (43 points) won the overall individual prize for 2010, and will engrave his name on the Claret Jug trophy. Matthew Molloy (34 points) was runner up for the 19 and over group. (Brian had to leave early for his sisters wedding, so Ciaran Stokes kindly accepted the trophy on his behalf). Dominic Leach, winner of the 18 and under prize with 41 points, gave an impromptu victory speech in his ice cream vendors jacket. Peter Fitzpatrick with 39 points was runner up. Team 6 (Johnny Kelsey, Mike Dobson, Tony Bray and Forbes Jamieson) won the 4 Man Team Prize, despite Mike Dobson almost taking out Tony Dixon with his final drive. Team 7 were runners up (Dominic Leach, Paul Thompson, George Tsiantar and Rick Devine). The Straightest Drivewas won by Noel Wright. The 2010 Longest putt was won by Ryan Harper with a magnificent 23 yards. Fantastic. 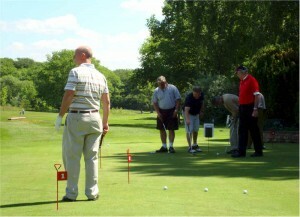 Finally, and to his enormous embarrassment, Peter Fitzpatrick had to award himself the Nearest the Pin prize. And so, too soon, the day was nearly over. 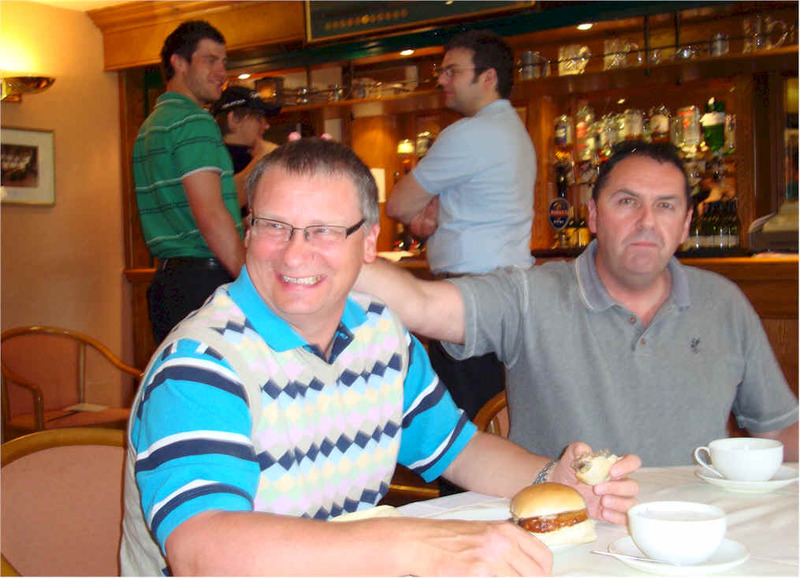 John Kennedy thanked the organisers, the staff, and all present for attending what had been another very successful St Ambrose Golf Society day. As Ryan Harper’s team 8 led the way to the bright lights of Hale (closely followed by Ryan’s Dad’s Team 3 “to supervise”) we reflected on what a difference a day makes. We hope to see you there in 2011.